Hockey fans are going to get a rare treat Wednesday night, as the NHL serves up a pair of Game 7s. It will be the first time in a little over three years that we've had more than one in a night, and having a pair of Game 7s on the same date is relatively uncommon; it's happened just ten times in the last two decades. But if you want to get into the really rare stuff, you have to look for the nights where there were three or more. That's only happened five times in NHL history, probably because hockey fans' hearts couldn't take much more than that. So today, as we get ready for a Game 7 doubleheader, let's look back at those five times that we've had three. We'll start with the most recent, which came three years ago. Before Wednesday night, this was the most recent case of even two Game 7s falling in the same night, as the opening round of the 2014 playoffs closed out with a trio of do-or-die games. At Madison Square Garden, the Rangers and Flyers played a tight game to cap off a back-and-forth series. Despite some decent star power on hand, the goals came from some unlikely sources, with Daniel Carcillo and Benoit Pouliot scoring for the Rangers while Jason Akeson replied for the Flyers. Henrik Lundqvist outdueled Steve Mason in a 2-1 Rangers win. We got another close one in Colorado, where the Avalanche faced the underdog Wild. A late goal by Minnesota's Jared Spurgeon pushed the game into overtime, where Nino Niederreiter finished off the upset. The night's third Game 7 wasn't as close, but it made some history. The Kings went into San Jose and stomped the Sharks by a 5-1 final, finishing off just the fourth comeback from a 3-0 series deficit in NHL history. After dropping the first three games, the Kings won the next four by a combined score of 18-5, and went on to capture the franchise's second Stanley Cup. We have to go back over a decade to find our next triple-header, and it starts off feeling a bit familiar: With the Wild knocking off the favored Avalanche in overtime. 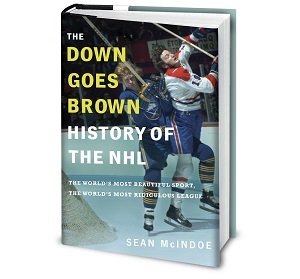 This time it's Andrew Brunette pulling off the move of a lifetime to send the Avs home – and end the career of Patrick Roy. The night's other two Game 7s didn't pack quite as much drama. In Philadelphia, the Flyers pounded the Leafs 6-1, sending Toronto home in the first round for the only time during the Pat Quinn era. And in St. Louis, the Canucks finished off a rally from down 3-1 in the series to knock off the Blues by a 4-1 final; the Blues went on to win just one playoff game over the next seven seasons.